Don’t have all day to hike and still want to get out? Here’s a hike for you. If you only have a couple of hours and want to get a good sweat going, I have a pretty decent 2.5 mile hike for you. Located in the Hudson Valley, (Carmel, NY to be exact) Fahnestock State Park has over 500 miles of quality hiking trails that are well worth visiting. The best thing that I have found about Fahnestock is that as compared to other hiking areas in the Hudson Valley, most of the hikes here do not begin with a thigh hammering and lung busting climb. Sure, eventually you will have hills to climb, but I have found that for the most part, Fahnestock’s trails are meandering and actually quite pleasurable. This particular hike begins on the Appalachian Trail (heading South) next to Canopus Lake on route 301. Although you start on the road on the AT, after descending some stone steps, the AT will continue to the right. You, however, will continue hiking until you reach the blue trail (Three Lakes Trail). Don’t worry, it’s not that far. 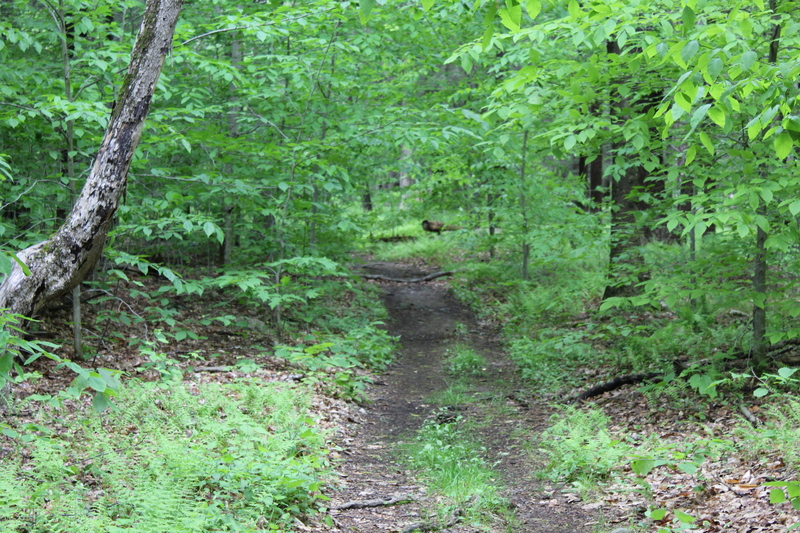 As you work your way down the trail, you will notice a mine entrance on your right off into the woods. Even though they are incredibly interesting, my advice to you is to not leave the trail to investigate them. Several people have done so and lost their lives. If you didn’t know, Fahnestock State Park is known for its rich iron ore mining that ocurred from the mid 18th century to the early 20th century. About a half mile into the hike, the terrain levels off and as the path winds through the woods, you will notice the changing vegetation and a drastic increase in the number of mosquitoes. Obviously from late spring and into the fall, bug spray is a must, especially if you are hiking with small children. Don’t think that just because it is a short hike you won’t suffer from bug bites. Take it from me, you WILL be eaten alive! As you make your way up the trail, three quarters of a mile in you will come to a point where you can continue straight or turn right and stay on the blue trail. For this hike we are going to continue on the blue trail. The trail remains flat for a short time and then quickly descends to a small stream. The amount of water in the stream varies based on the time of year as well as how much rain has fallen in the recent past. On this day, not much water was running so crossing was a breeze! Even though the entire hike is only 2.5 miles long, this would be a perfect place to stop for water or eat lunch or a snack with the kids. After a break you will head downhill for a very short time and then you will begin climbing again. On this hike, this will be your only somewhat major climb. Walking steadily uphill for 5-10 minutes you will come across a large mound of rocks. You need to pay careful attention at this point to the trail. As you look at the picture below, you can see a trail straight ahead and to the right. You will want to go right and you will now be on the AT (North). The Three Lakes Trail continues straight ahead for a few more miles. (that’s a hike for another day!) What you can not see in this picture is that the AT is also on the left, and that goes South. As you make the right turn onto the AT, it’s pretty much smooth sailing all the way back to where you began your hike on Route 301. This is the last landmark that you will see on the AT as you head up to the left back to the road. Like I said at the beginning of this post, this is the perfect hike if you only have a couple of hours to get out. I used to do this hike with my kids when they were younger and it proved to be the right length and difficulty to keep them interested in the hike. This entry was posted in Uncategorized and tagged Appalachian Trail, Blogging, Fahenstock State Park, Hike, Hiking, Hiking the Appalachian Trail, Hiking with Kids, Hudson Valley Hikes, Hudson Valley Hiking, Kid friendly hikes in NY on May 30, 2016 by The Zen Hiker. Located approximately one and a half hours from where I live in Mahopac, NY is one of the finest used bookstores that you will ever find. Tucked away in sleepy Hillsdale, NY, Rodgers Book Barn has been a destination of choice for bibliophiles since 1972. I know that I have been a regular visitor (3-4 times per year) since 1991 and have yet lost my desire to return year after year to see what has been added. This out of the way gem reportedly has 50, 000 books, a claim that would be very hard to dispute, unless of course you decide that you want to count every book. Just check out the pictures of the interior that I have posted! The beauty of the Book Barn lies not in the fact that they have so many books, it is instead the layout of the Barn that promotes an atmosphere where it is ok to spend hours browsing the varied and eclectic titles that the owner, Maureen Rodgers offers. Although used, the books are all in pretty good shape and are only a few dollars a piece (at a maximum). Just to let you know in advance, at the very least you will buy several books during your visit. I have found that it is impossible not to do so, and you will not be disappointed. From classics that you read twenty years ago to a new find, Rodgers Book Barn has books that you won’t find anywhere else. If the weather is nice, as it was when we went yesterday, you can hang out at one the tables outside of the Barn and peruse your purchases! A win-win all around. For those of you who hike, I am also currently investigating several hikes in the area so you could do double duty and make a full day of it. Rain or shine, what could be better than a hike and an excellent used bookstore? Check back later for more details. This entry was posted in Uncategorized and tagged Day Trips, Excursions, Reading, Rodgers Book Barn, Upper Hudson Valley, Used book stores, Used Books, Weekend day trips on May 29, 2016 by The Zen Hiker.